I don’t know how you do it, my friend exclaimed. I cringed in response, thankful we’re on the phone. I know she means it as a compliment. She wants to be supportive, for me to know she’s in my corner. I’ve heard that from a number of friends, even acquaintances. It’s a way for them to recognize the extraordinary circumstances I’m working against and yet still keep moving forward. But when I hear “I don’t know how you do it,” I feel defeated. I feel deflated. I feel overwhelmingly sad. My reaction is a reflection of just how hard this struggle can be — who doesn’t want to be recognized for how hard they’re working? But for me, it reminds me that I DO have to work this hard, day after day, week after week, month after month. When you’re the mom of kids with special needs, with mental health issues, with learning disabilities, you don’t choose this! I didn’t choose a life where I have to be a supermom. What must it be like to only worry that your three-year-old gets revved up the half an hour before bed instead of wondering how your ADHD kiddo will ever stop bouncing off the walls all day long? What must it be like to only worry that your middle schooler misplaces their homework once in a while instead of wondering how your child, who can barely even keep track of any homework over a year, will function in high school, let alone college? What must it be like to have the odd check up appointment rather running to and from multiple medical and therapy appointments a week with the other kids in tow? What must it be like to only worry if your 3rd grader is always happy instead of wondering if your child diagnosed with depression will face these demons their whole life? Life may be a marathon, but there are many days I don’t see the light at the end of the tunnel. There is simply no end – just me running on some hamster wheel, hitting my head against the wall trying to get my kids the best care I can, working myself to the bone emotionally until there isn’t anything left for me… and then I get up the next day and do it all over again. Even when the kiddos aren’t with me, I’m thinking of them, worrying about them, educating myself about how to help them more at home or second guessing myself in what I could be doing better. It’s a terrible cycle that has allowed me to support my kids as well as I have. My husband says – go get a pedicure and do something for yourself. But self care isn’t really self care when you’re tapped out. It’s just a small plug in the dam that feels like it’s about the break. Moments of self care don’t revive you… they’re just a moment of indulgence. And then you’re right back where you started. I find myself taking in a deep breath, trying to shake the oppressiveness of these responsibilities. Because many days, I don’t feel like I can actually catch my physical breath, let alone mental. So how do I do it all as a mom of kids with high needs? I pick and choose what will get attention. I cut corners where I can. The first thing that‘s flown out the window is my blog. I really haven’t been paying attention… not because I don’t care about you my readers but because the breathing room has to come from somewhere. The next were dinners… paper plates have reappeared on our table. Take out has also become a standard. Laundry — yeah. If the kids have clean underwear, it’s taken care of as far as I’m concerned. I make lists for EVERYTHING because at this point, if it isn’t written down, it’s not going to happen. Ever. I forget a whole heck of lot. Like birthday cards for friends… and my parents. I used to plan for the week. Now I focus on planning for the next 12 hours. 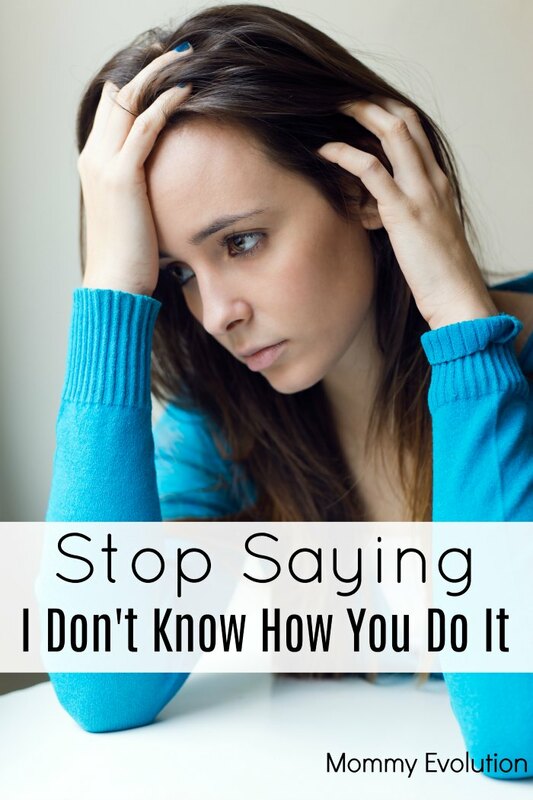 “I don’t know how you do it” somehow implies that I am doing it — but I’m not. I feel my “failures” every day. Yes, my plate is full. But it’s also spilling over and I’m just as busy ignoring all of things that don’t get done as the ones that do. I admire your courage in doing what needs to be done for your kids. I think you’re doing an incredible job with your kids. Read more about special needs parenting on Mommy Evolution! I want to send this to everyone I know. It’s so SO true – all of it – from the “actually, I am NOT doing it all” to the blog negligence to the self care thing: I can’t stand it when people who have a very different reality talk about what I need to do. what i NEED is a year at a spa. Nota pedicure. And since I can’t have the year at the spa I am going to Get Through These Next 12 Hours, baby. And I’ll mostly be thinking about my kids during that time, because if I don’t figure some stuff out it’s not that they are going to not get into Yale it’s that they will end up homeless, ok? Whew. Guess this post brought up some…feelings?! What an honest post! I love this. And while I don’t have kids with special needs and I can’t possibly know or understand exactly where you are coming from I do think it’s pretty safe to say you are not failing. I think all of us so easily see our faults and those areas we could do better but I think part of what you need to hear when people do say “I don’t know you do it” is that they are impressed with all of your successes. Your kids are fed, they’re clothed, you are making sure their needs are met– that’s HUGE!